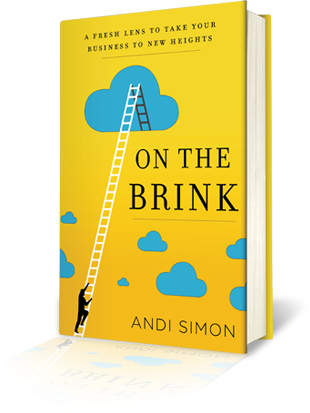 000: Meet Andi Simon And Celebrate "On the Brink," A New Podcast Designed Just for You! Hi! I am Andi Simon, the host of our new podcast which is all about helping you overcome the hurdles and obstacles of our rapidly-changing world. I can't wait to share with you some of my passions and why this podcast is so exciting. A Corporate Anthropologist and award-winning author, my passion is all about helping people change. My firm, Simon Associates Management Consultants, specializes in working with organizations that need or want to change. I've recently written a book on the subject,"On the Brink: A Fresh Lens to Take Your Business to New Heights," which tells the stories of seven companies that had to rethink where they were going, why they weren't getting there and what changes needed to take place in order for them to truly succeed. I launched my On the Brink Podcast to help you "see, feel and think" in new ways so that you, too, can take you and your business to new heights. Each conversation is filled with ideas, stories and tools you can use to help you and your business ignite change and "soar." You'll hear me interview terrific thought leaders and businesspeople who are deeply involved in change—CEOs, consultants, change agents, entrepreneurs, managers and a whole host of others. Their breakthrough ideas help you "see" your job, company, career and business opportunities with fresh eyes and they share real-world, easy-to-apply lessons about how to successfully adapt to change. I finish each episode with helpful tips you can use in your business and in life. Thank you for joining me on this amazing journey!